It was December 2010, and it was my last business trip of the year. I arrived at Philadelphia Airport two hours before my flight and the Departures Sign said my flight was delayed. As an Irishman with a positive attitude, I take delayed flights as a religious sign that God wants me to drink beer! I went to the bar near my departure gate and settled into a few pints of the local Yuengling brew. About 45 minutes before my flight was due to board, I went to the departure gate. The Christmas crowds had started and the gate area was crowded wall to wall. There was an aura of frustration and anxiety from the passengers as they peered at the flight departure notice board wondering if the plane would take off that night. My positive attitude was beginning to erode because I was scheduled to deliver a keynote speech to 200 people the next day. I had no back-up plan, and I did not want this delay to grow into an overnight stay. Every now and again, the airline departure gate-woman would speak into her microphone to give us a flight update, but her voice was not carrying. The microphone was possibly at the end of its life and was not picking up her voice. In addition, she was not making any effort to project her voice so she could be understood. I could feel the frustration and anger building up in the gate area. One person asked me what she had just said and, with a token effort at humor, I stuffed all my fingers in my mouth and mumbled, “This is a very important notice please pay attention.” The person who asked me the question chuckled as she caught on to my sarcastic retort. Eventually we started boarding the plane by priority number, and she frustrated the passengers even more because they could not clearly hear what group number she was announcing. People were lining up to get their boarding passes scanned prior to entering the plane only to find that their group number had not been called yet. They got extremely angry when they were told to go back into the hoards of people and wait until their group number was called. Ah, the joys of business traveling! By now, you are probably bitterly disappointed that this story does not include at least some sort of “spicy” story about diaphragms and a young woman getting into “trouble”. This section is not about using a catchy headline to get your attention and keep you reading, this is about understanding the mechanics of your body (vocal chords, lungs, diaphragm) to help you project your voice and connect with your audience. In my public speaking club, sometimes we have members who have relatively quiet voices. Their voice projection is just enough to speak to small groups of people in close proximity; however if you put them in the same room with 100 people or more, they will not be able to project to the back of the room. There is nothing more annoying than not being able to hear what a speaker is saying or what an audience is asking during a question and answer session. In the absence of an effective microphone, success in public speaking requires us to be able to adjust our voices to take into consideration the audience size and any background noise. 1. Build confidence in your speaking voice; get accustomed to speaking to audiences of different sizes. The more times you stand up in front of an audience, the sooner you will reach your goals. 2. Know your speech material so that you can focus on honing your voice whilst delivering your material in front of an audience. 3. Get comfortable hearing you own voice at different volumes. I use my daily commute time to practice my speeches. Try different character voices, intonation, accents, and volume. If you are driving in Dallas, Texas, and you see an energetic and animated person alone in his car speaking passionately to himself…give me a wave!!!! 4. Your posture is extremely important to maximize your ability to project your voice. Stand upright with your face aimed at your audience. If you tend to bend forward or lean towards your audience, you will reduce the available capacity of your lungs. 5. The voice itself does not have a lot of power. The projection comes from large volumes of air passing over the vocal chords. More air = more projection capability. 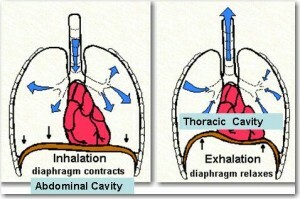 The process of breathing is performed primarily by the movement of the diaphragm. The diaphragm is a large muscle that separates the thoracic cavity from the abdominal cavity. 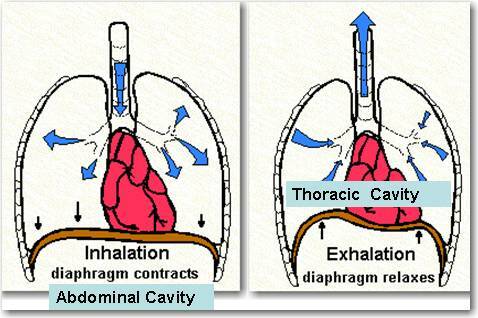 When you breathe in, the diaphragm contracts, causing a vacuum in the thoracic cavity. This helps inflate the lungs by drawing in air through the mouth or nose. When you breathe out the diaphragm muscle relaxes, allowing air to flow out as the lungs deflate. You can practice getting comfortable with maximizing the movement of the diaphragm by imagining that you have a drinking straw in your mouth and slowly inhaling through it. If done correctly, you will feel your stomach rise and fall as you inhale and exhale. The signs of ineffective breathing during your speech can be your shoulders moving up and down with each breath. This indicates shallow breathing and will not be conducive to voice projection. 7. It is critical to understand the difference between voice projection and shouting. Shouting has a shrill tone to it and not only can it damage your vocal chords, it can also irritate your audience. 8. One way of practicing this voice projection technique is to find a large room and put seats at the back. Invite some friends and practice speaking to them from a distance. If they cannot hear you clearly, get them to give you a visual sign such as pointing to their ears. This allows you to step up your voice a notch. Get feedback on whether your voice sounded pleasant or whether it had a harsh tone to it. 9. Remember to look after your voice and hydrate your body. Start drinking water at least two hours before you speak. Do not drink coffee, alcohol, or dairy products as they can have a detrimental effect on your vocal chords. Warm up your vocal cords by practicing your speech out loud, and gradually increasing the volume and voice projection.